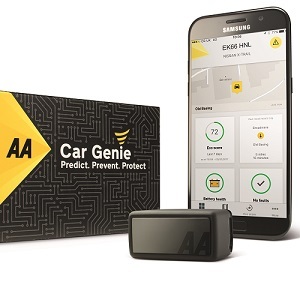 A ground-breaking consumer technology from the AA which has already helped predict and prevent breakdowns for tens of thousands of car drivers across the UK is due to be launched into the business sector later this year. Going significantly beyond the scope of existing, off-the-shelf telematics-based products, CarGenie provides fleet managers with unrivalled visibility and control over their vehicles. This enables proactive decision-making about repair and maintenance scheduling and helps to negate the risk and associated costs of breakdowns. CarGenie has undergone extensive trials across more than 10,000 vehicles and analyses a huge amount of data compared with other systems on the market. This has resulted in greater understanding of the probability that a fault code will lead to a breakdown and so when an alert needs to be sent to the customer to arrange maintenance. The device can be simply installed into a vehicle’s onboard diagnostics port, from where it analyses the diagnostics in real time, with information then conveyed to the CarGenie app which is available on both iOS and Android. Conventional telematics attributes also provide fleet managers with data on driving behaviours, helping to identify areas for improvement, helping to improve safety while potentially leading to cost savings in areas such as fuel and tyres. “Preventative maintenance systems are not new to the marketplace,” said Jennie Hill, director, business services at the AA. “However, we believe that what sets CarGenie apart is the rigorous product trials and testing we’ve undertaken to ensure the product is tailored to our business customers. “CarGenie takes a significant burden away from fleet managers and allows them to focus on other aspects of their role. Not every fault code requires a vehicle to be taken off the road immediately – indeed some just go away by themselves – and the system has been designed to only alert customers when the fault is dangerous or likely to cause a breakdown.